The Nationals announced Baker's hiring on Tuesday, nearly a month after firing Matt Williams when the club missed the playoffs. With Baker joining the Nationals, baseball avoids what would have been its first start to a season since 1988 with zero black managers. When the Seattle Mariners fired Lloyd McClendon last month, it left no black managers in the major leagues. No season had started without at least one since 1988; in April that year, Frank Robinson replaced Cal Ripken Sr. with the Baltimore Orioles. Robinson later managed the Nationals. 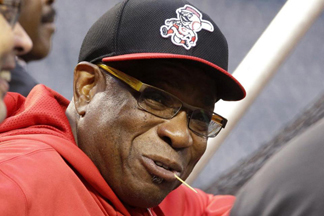 “Dusty Baker is highly qualified, has years of managerial experience and is a proven leader,” Manfred wrote. In the 66-year-old Baker, the Nationals get someone who has worked 20 seasons as a manager in the majors and whose 1,671-1,504 record — a .526 winning percentage — includes the second-most victories among active managers. He led the San Francisco Giants to the 2002 World Series and reached the postseason a half-dozen other times. He becomes the second-oldest manager in the majors at the moment, a few weeks younger than Terry Collins, who just led the New York Mets to the World Series. Baker also managed the Chicago Cubs and, most recently, the Cincinnati Reds, who fired him in 2013. He has a reputation for being able to handle different clubhouse personalities, including managing Barry Bonds while with the Giants. Washington said general manager Mike Rizzo and Baker will wait until Thursday to hold a news conference; Rizzo spoke about Williams’ firing on a conference call. Williams, who played under Baker with the Giants, had never managed in the majors when he was hired for the 2014 season. The Nationals won their division and he was voted NL Manager of the Year; a division series loss to San Francisco followed. Williams then presided over a 2015 season filled with defeats, discord and the embarrassing spectacle of a dugout dustup between NL MVP front-runner Bryce Harper and teammate Jonathan Papelbon during a game the day after the team was eliminated from playoff contention.